Great Beachfront Property ! Summer availability ! This beautiful, three-level townhouse is centrally located in the Destin area on Scenic Gulf Drive. It is directly on the beach, so there is no need to cross the street or use the elevator to get to the beach. You are already there!! This is one of the most beautiful, white sand, stretches of beach in all of Florida! This unit is very close to the water: no pool needed ! This property is a 3 level townhome with 2 front entrances. During Spring, Summer, and Fall, we only rent the entire townhome. During Winter, the townhome may be split into 2 seperate units via a door on the 1st level which can be locked to separate the 1st level from the 2nd and 3rd levels. The entire unit sleeps 10. The 1st level (B) unit sleeps 4., The 2nd & 3rd level (unit A) sleeps 6. Each unit has it's own entrance from the parking area. Only one party can rent the townhome at a time, even when the units are separated. This allows for more privacy during your rental. The first floor has two bedrooms with a queen-size bed and closet space in each room., There is one Jack & Jill bathroom on the first floor, with each bedroom having a lockable door to the bathroom. The first level also has a laundry room with full-size washer and dryer, a refrigerator, microwave, and coffee maker. The first level also features a private deck/balcony with a gas grill, table & chairs. The second floor consists of a full sized, fully stocked kitchen, dining area, living room, and half bath. This level also features a large deck/balcony with gas grill, table & chairs. The master bedroom is located on the third level and has a private master bath, laundry room with full-size washer and dryer, lots of closet space, and a smaller private deck as well. There is also a bedroom with queen size bed, and another private bathroom on this level. The entire unit sleeps 10 people with 1 king bedroom, 3 queen bedrooms, and 1 queen sleeper sofa located on the second level in the living area. Yes we have wireless internet, and cable TV at every sofa and bed space ! Swimming in the Gulf is only fifty feet away!! Beach is accessed via angular staircase from the unit going down to a landing deck which features a shower for rinsing, beach chairs, beach toys, etc. The beaches of Destin are among the best in world, the beautiful white sand along with its blue-green water make it an excellent travel destination ! The master suite has a master bath with seperation between shower area and vanity area. Another full sized bath in upper level. Another full sized bath on lower level, and one half bath on center level. Parking spaces are directly in front of unit. This is a fully stocked kitchen and should have kitchen utensil or acessory needed. There is a full sized dining table with 4 chairs in center level, a small dining table with 2 chairs in lower level, and tables with chairs on the decks. Beach toys provided on beach level deck. This unit features a Tommy Bahama styling decor, and has many recent improvements like new expanded balconys facing the beach, new tile flooring, new granite countertops, new geo-thermal AC unit, stone front entrance with beautiful new doors and electronic door locks, new queen sleeper sofa, all new flat led tv's, and more !! We had a great time. It was nice to have the beach away your back door. This is the perfect location for those wanting to be close to the ocean. The views are wonderful and there is a perfect little downstairs porch with a private entrance for leaving beach toys so you’re not bringing in so much sand. The ground floor is a great space for early risers and those who have a harder time with the stairs. The website it very clear that there isn’t a pool and that there are stairs to deal with and I would recommend this location to anyone who doesn’t look for those features. For our family this location made for our best vacation so far! Great location- steps to the beach. Basic cable, no ESPN, weather or news channels. Time for some interior paint and new furniture, linens and pillows. Place needs a refurb and deep cleaning. It's always disappointing to see a less than great review of my property. Every year, we do updates and refurbishing of the townhome. The entire interior was re-painted, including all walls and ceilings were re-painted 3 years ago. We are constantly replacing furniture and appliances (all kitchen appliances new within past 2 yrs, etc. ) We provide basic cable, same as most other beach rentals. I agree that the basic cable service in this area does not offer many of the common favorites. I will look into upgrading the cable service package. Thank you for the review. 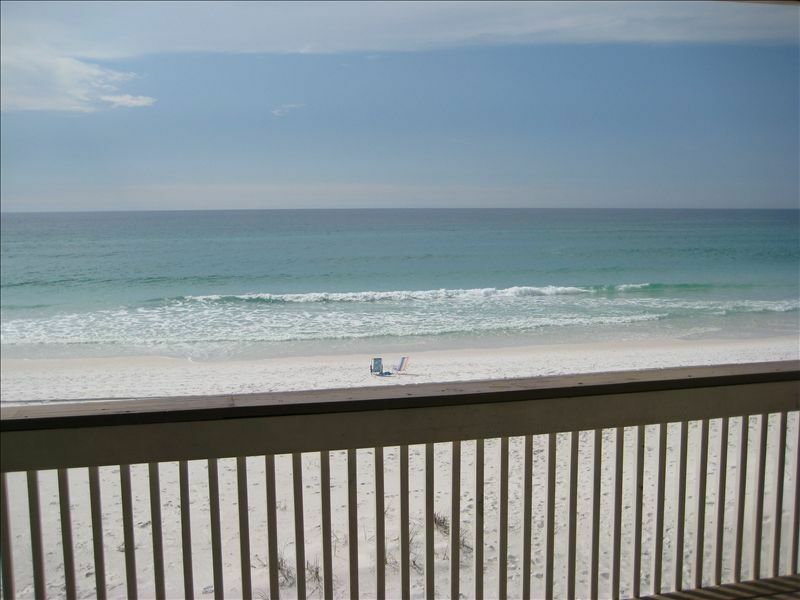 My family goes to Destin every year and we love staying at Sanddollar Townhomes. This condo is right on the beach and the view is outstanding. David , the owner of the condo, is so wonderful to deal with. Thank you David for sharing your condo with our family. We will definitely be back. The place was great, the cable sucked and so did the parking, but other than that we all loved it. This townhouse is in the best location! Directly on the beach, with your own private access. Close to Pompano Joes (walked on the beach to get their for dinner). The decks are so nice to sit on and take in the beach and ocean. The top and middle floor are nicer than the first floor, but it served its purpose of sleeping. The townhouse was clean, as were the linens. The owner was easy to reach when we had a question. The entire building itself is older, but it seems like all the ones directly on the beach are. Being so close to the beach when you have little ones makes a world of difference. I would rent this unit again. This is a great central location on Scenic Gulf Drive. Walk to Pompano Joes, shop at the nearby outlet malls, play golf on a number of world class courses, take the kids to Big Kahuna water park, or best yet, enjoy the ocean directly outside your door ! Cleaning fees must be added to price of rental. Cleaning fee for entire unit is $175. Cleaning for 1br (B) unit is $50. Cleaning for 2br (A) unit is $125 Please inquire for pet restrictions and fees Please inquire for rental rates of seperate (A & B) units.